What happens when you pair the singer of sanitized indie rock band Vampire Weekend and 19-year old Jaden Smith? Apparently, an anime series on Netflix called Neo Yokio, which is being marketed as a "postmodern homage to classic anime, English literature, and modern New York fashion and culture." In other words, it sounded like a really good idea at a party around 4am after watching some anime for the first time. Neo Yokio is supposed to be a homage to classic anime as well as a satirical send-up of the genre, but the trailer just makes it look like a mess with a bunch of star-studded voice acting. The first Neo Yokio trailer comes to us courtesy of Netflix's official YouTube channel and it's an assault on the senses. Neo Yokio is written by Ezra Koenig (Vampire Weekend) and Nick Weidenfeld (Metaloclypse) and stars Jaden Smith as the main character, Kaz Kaan who slays demons. The story takes place in Neo Yokio, a city that is proclaimed to be the greatest city in the world by narrator Jude Law. Smith is Kaz Kaan, a "magistocat," a member of pink-haired demon slayers, Kaan would rather shop for clothes and mending his broken heart. The trailer is a giant mashup of too much going on, which is obviously a way of poking fun at traditional anime. The official synopsis for the show aims to be funny for fans of the anime genre. The synopsis reads. "Welcome to Neo Yokio, the greatest city in the world. It's the most populous urban agglomeration in North America, but its prestige does not merely stem from its size. Neo Yokio is a diverse labyrinth of cultural and architectural innovation at the forefront of global fashion and finance. 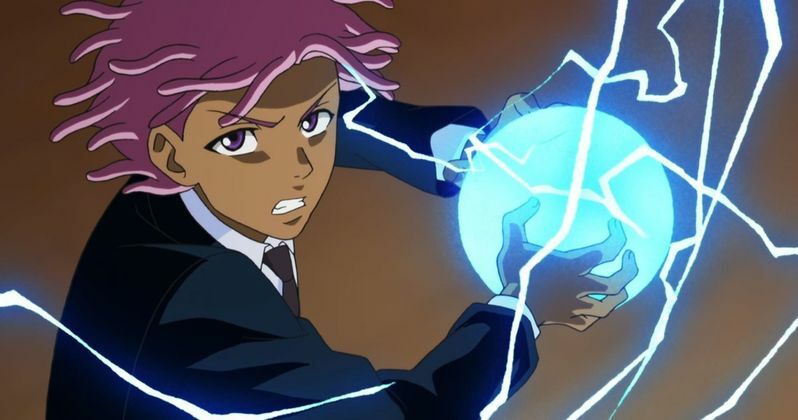 All of this is cold comfort to the lovesick Kaz Kaan (Jaden Smith), the youngest member of a family of: "magistocrats" - pink-haired demon slayers who once liberated the city. Today, his demon-slaying is barely more than a side-hustle coordinated by his Aunt Agatha (Susan Sarandon) - Kaz himself would rather concern himself with shopping, field hockey and - of course - mending his broken heart. Always by Kaz's side are his faithful mecha-butler, Charles (Jude Law), and his inseparable friends Lexy and Gottlieb (The Kid Mero and Desus Nice) as he navigates the complexities of life in Neo Yokio and tries to stay one step ahead of his arch-rival, Neo Yokio's number one most eligible bachelor, Arcangelo Corelli (Jason Schwartzman.) Things take a mysterious turn when Kaz is drawn into the turbulent world of ex-fashion blogger Helena St. Tessero (Tavi Gevinson), setting in motion a sequence of events that force him to question everything he knows about Neo Yokio." Overall, the show seems like an inside joke from the original 4am party idea that neither pays homage to classic anime nor satirizes it. We'll have to wait until the 6-episode series drops on September 22nd, 2017, exclusively to Netflix subscribers, to see if it's worth watching. In other Jaden Smith news, the 19-year old is setting his eyes on opening his own restaurant in addition to continuing to rap and run his lifestyle brand called MSFTSrep. It is not clear at this time when the restaurant will open or what kind of food it will serve, but Smith decided that the food service industry is something that he needs to get into next. Apparently, this is what the children of Will Smith and Jada Pinkett Smith do on their downtime, that and prank people by telling strangers that you're "legally crazy" because why not? If hipsters making fun of anime sounds like a good time to you, make sure you check out Netflix's Neo Yokio on Netflix later this month. And don't worry, more Vampire Weekend music is on the way too as Ezra Koenig promises that the new record is 80% finished. The whole anime project starts to make sense when you think of his band being satirical version of indie rock. Be sure to check out the trailer for Neo Yokio below.